Special Containment Procedures: SCP-1149 is to be kept in a secure room at the west-most end of Site 37, located in a remote location on the northwest coast in the United States. To minimize the conspicuousness of its effects, SCP-1149 is to be pointed due west toward the Pacific Ocean at all times (see Incident Report 1149-A). It is to be firmly attached to its support structure, which is itself to be anchored to the floor. Accelerometric and atmospheric sensors attached to the support structure will transmit readings to a nearby monitoring center. Atmospheric conditions within SCP-1149's containment room are to be kept stable with an air lock permitting entry. A single fan mounted in the wall of the room to the east of SCP-1149 is to be tightly covered and locked in position until it is required for testing. When opened, air speed shall not exceed 30 km/h. Access is restricted to Level 1 personnel with the approval of a superior. All test software and all test equipment must be inspected by at least two Site 37 Technical Review staff members. SCP-1149's wires must be grounded during any test until more information about the object is obtained. Approval for complete testing of a vertical, upward orientation is currently pending. Testing of a vertical, downward orientation is prohibited at Site 37 due to its close proximity to major fault lines and no site transfers are currently pending at this time. SCP-1149's rough "cone of effect" has been classified as a conservation area and all non-emergency watercraft and aircraft are disallowed access. Two patrol teams using United States Coast Guard motor lifeboats will monitor the boundaries of the cone of effect for trespassers. Patrols should not pursue trespassers, but should contact researchers in charge of SCP-1149 for further instructions. 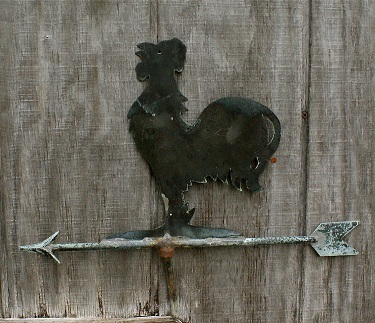 Description: SCP-1149 is a rusted weather vane approximately 45 cm long and 30 cm tall bearing no discernible manufacturer's mark or any particularly identifying features aside from the common rooster ornamentation. The base of the vane is corroded and appears to have broken off from its mount sometime prior to recovery. Within the severed mount point, two frayed wires run further up into the vane. Interior imaging shows them terminating just beyond the "feet" of the rooster and reveals no power source or other notable components. The wires are believed to have once connected to a control mechanism. SCP-1149's anomalous properties appear to always be in effect but are amplified in density and frequency when wind passes over it in the direction in which it is pointing. While active, weather activity will become erratic in the vicinity of SCP-1149. Most of the anomalous effects will occur within a "cone of effect", approximately 215 km long with an arc of 5 degrees, originating from the object's arrow tip. While the frequency of appearance of these effects does taper sharply near the boundaries of this cone, anomalous effects have been observed, on rare occasions, well outside of the cone of effect. When kept out of the wind, SCP-1149 causes an anomalous weather event to occur within its cone of effect once every 15 minutes on average, with each event typically lasting between 10 seconds and 2 minutes, depending on the intensity of the event. When exposed to air traveling along its length (i.e. west, in its current orientation), the events become more frequent and last longer. When exposed to winds between 25 and 40 km/h, the events will be continuous at the center of the cone of effect, with events stopping and starting randomly near and beyond the borders. Beyond 40 km/h, events will begin to overlap, creating a continuous event growing in intensity until the speed of the wind passing over SCP-1149 decreases below this threshold. Incident Report 1149-A: The original containment procedures for SCP-1149 had it secured in place pointing directly away from the Earth's surface. It was believed that this orientation would result in the lowest possible magnitude of abnormal weather events. However, the object's effect on upper atmospheric layers was not predicted. In the days following initial containment, a slight yet noticeable increase in "sprite" electrical events and aurora effects was observed over Site 37. The frequency of these otherwise uncommon events was deemed to potentially draw undue attention to Site 37, and SCP-1149's containment procedures were updated for a westward orientation. Addendum 1149-1: SCP-1149 was discovered in the ruins of a small coastal cottage in ███████, OR after a strong storm had passed through the area. While the primary storm itself was not strange in and of itself, Foundation agents were dispatched to the area when highly anomalous weather effects were observed over the Pacific Ocean, focused in a rough cone-shape emanating from ███████. Agents were unable to find the owner(s) of the cottage, though evidence suggests that the property had been inhabited until a short time before the cottage's destruction. SCP-1149 was found firmly affixed to the remains of what is assumed to be the interior wall of a shed. A wider search of area was unable to locate SCP-1149's base or any further information regarding SCP-1149's origin or operation. Addendum 1149-2: Wind Testing Log All tests were conducted under closed conditions at Site 37. Weather stations took readings from Site 37 itself, as well as from observation vessels located at multiple points along the boundaries of SCP-1149's cone of influence. When high-accuracy readings were required, a geostationary satellite was used. The wires leading into SCP-1149's base were grounded for these tests. Summary of events: Five events were recorded during this period. The first was the formation and dispersal of an abnormally small cumulonimbus cloud, accompanied by expected degrees of rain and lightning, which lasted for two minutes. The second was a pocket of fog, less than a kilometer in diameter, lasting for 45 seconds. The third was an area of intense heat, first noticed by the evaporation of sea water it caused. Temperatures were measured to reach 129° C at the height of the event, which lasted 30 seconds. The fourth event was another pocket of fog, over a smaller area, accompanied by a temperature drop of approximately 10° C relative to the surrounding area, which lasted 3 minutes, 25 seconds. The final event was a small waterspout, forming without accompanying cloud cover. The cyclone lasted for 1 minute, 10 seconds, and remained in contact with the surface of the ocean for 30 seconds of that time. Cyclone wind speeds reached a peak of 112 km/h. Researcher's note: For brevity's sake, following logs will only note newly observed phenomena. Observed effects: Six events were recorded during this period. Of these, two consisted of new weather effects. The first of these lasted for 4 minutes, 10 seconds. A cloud of unusual density formed in a structure not previously observed on Earth. This cloud was accompanied by intense lightning strikes for the duration of its existence, and dropped rain, turning to snow, then back to rain. The second unique event occurred at the end of testing and lasted for 5 minutes. During this time, the temperature rapidly dropped in an area that grew to 0.25 km in diameter at the height of the event, with temperatures dropping to -80° C. Water vapor in the air condensed and froze, creating a fog-like effect. The surface of the ocean also froze within this area of effect, to an estimated depth of 1.2 meters. Observed effects: Four events were recorded during this period. No unique events occurred. Researcher's note: This would seem to indicate that blowing perpendicularly doesn't have any effect. Though perhaps something will be observable at higher wind speeds. Researcher's note: Test W-06, omitted for redundancy, further supports the above theory. Only air that travels along the length of SCP-1149 affects its effects. Observed effects: Events were continuous during this period with many occurring simultaneously. Most were not unique, though three were of particular interest. The first was a highly dense, rapidly rotating cloud mass. After observing its odd color, further analysis indicated that it consisted of water mixed with hydrochloric acid, abnormal levels of carbon dioxide, and methane. The cloud mass was accompanied by frequent lightning and a partially formed cyclone. This event lasted for 9 minutes, 25 seconds. The second unique event was the repeated rapid formation and dispersal of an extremely low-pressure area, which was observed by the column of water that was quickly drawn up into it, then dropped. This process was repeated 6 times in a small area over the course of 1 minute, 10 seconds. The third unique event was a variation of a previously observed event. Over an area approximately 20 m in diameter, the air temperature rose and quickly peaked at 334° C, lasting for a total of 11 minutes. During this time, the surface of the ocean vaporized, creating a growing plume of steam. This event manifested near one of the observation vessels involved in testing, resulting in heat damage to part of the vessel's structure and varying degrees of burns to each of its crew. The event caused no fatalities and the vessel was able to retreat before damage became too great. Researcher's note: Containment procedures updated. With events of this nature, we need a system in place to prevent people from entering the area. Observed effects: Clouds immediately began to form, starting at the center of the cone of effect and spreading outward. Cloud composition was determined to be a condensed mixture of water with small amounts of hydrogen, helium, and ammonia. Lightning strikes were frequent, occurring nearly continuously starting at approximately 3 minutes. At approximately 5 minutes, the temperatures climbed above 90° C, causing the ocean within the cone of effect to begin vaporizing at an increased rate. Observation vessels retreated and were able to avoid damage for the duration of the test. At approximately 15 minutes, cloud cover began condensing drastically and rotating rapidly, causing winds to reach speeds in excess of 400 km/h. At this point, the cone of effect had doubled in size due to indirect effects and the ocean continued to vaporize at its accelerated rate. By 27 minutes, the rotating storm had reached 240 kilometers in diameter with wind speeds recorded at ███ km/h. Small pockets of extremely high temperatures and pressure were observed, resulting in ionization of the air and bursts of light and sound similar to lightning. Satellite imagery reveals that at this point the storm bore a strong resemblance to [DATA EXPUNGED]. Testing was concluded at this point. The weather effects quickly dropped off in intensity, but did not fully disperse until over three hours later. The storm made land fall 20 minutes after the conclusion of testing, but by this point clouds mostly consisted of water and caused damage no worse than that of a typical tropical storm of mid-level intensity. Researcher's note: Containment procedures updated. I think we can adequately test this thing without going over 30 km/h. We could've been in trouble if those poisonous clouds made landfall. Addendum 1149-3: Electrical Testing Log All tests were conducted under closed conditions at Site 37. Weather stations took readings from Site 37 itself, as well as from vessels located at multiple points along the boundaries of SCP-1149's cone of influence. When high-accuracy readings were required, a geostationary satellite was used. SCP-1149 was under 5 km/h wind speeds for each of these tests. The wires leading into SCP-1149's base were connected to varying electrical signals. Observed effects: Effects similar to test W-07. Test terminated early. Researcher's note: A direct current seems to simply amplify the effect. No need to prolong the test. Observed effects: Effects were especially erratic. Multiple events would occur at once and would quickly disperse, followed by calm periods. At times, events would be grouped together, and at others they would have no apparent grouping pattern. Single events occurred at multiple points during testing as well. None of the observed events were unique. When the timeline of observed behavior was compared to the timeline of the program's output, no further patterns could be deduced. Observed effects: Immediately after testing began, a single event started approximately 25 km (16 mi) directly west of SCP-1149. A high-pressure, high-temperature pocket formed, vaporizing the ocean beneath it. Much of the resulting steam was drawn into the pocket, which began to rotate, quickly picking up speed. The cyclone of water vapor soon reached a height of approximately 0.4 km, becoming hotter and denser as it drew more water into itself. By this point, wind speeds had exceeded 150 km/h. After 1 minute, 30 seconds of testing, the cyclone began to emit light. After 1 minute, 45 seconds, the cyclone had grown to approximately 1 km high with an immediate area of effect of approximately 0.15 km. Observation vessels nearest to the cyclone began to retreat due to the danger of the extreme light and heat. After 2 minutes, 21 seconds of testing, the cyclone was clearly visible with no magnification from the observational satellite. The heat and electromagnetic field of the cyclone were measurable at Site 37, causing multiple containment alarms to be triggered. The closest observation vessels to the cyclone began to suffer heat damage as they continued to retreat. At this point, the electric signal was removed from SCP-1149, its wires were grounded, and the wind in its chamber was shut off. This resulted in the cyclone quickly expanding and returning to normal pressure, ejecting extremely hot water vapor and super-heated liquid water out over a radius of over 8 km, causing ██ injuries and 1 fatality to observational crew. The sudden expansion also caused a small tsunami, resulting in minor property damage along the coast, though it caused no civilian casualties. Researcher's note: Containment procedures updated. We should discontinue this line of testing until we know more about what we're dealing with.